Last Jan. 21, the U.S. Supreme Court set off a political earthquake, ruling in the case of Citizens United v Federal Election Commission that corporations, labor unions and other groups are free to spend money seeking to influence political campaigns, although they still can’t contribute directly to candidates or their organization. 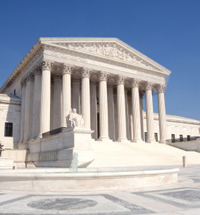 The ruling “may make the hundreds of millions spent in past presidential and congressional elections look like a pittance,” declared veteran Supreme Court watcher Lyle Denniston at SCOTUSblog. The tsunami from that decision continues to spread. While the full ramifications haven’t yet been measured, aftershocks are already shaking the political ground. Even before corporations and other groups start writing checks to exercise their new-found freedom, the Citizens United case appears likely to emerge as a key litmus test in the process of selecting a successor to Justice John Paul Stevens, who has announced his plan to retire after the current Supreme Court term. The remark appeared to prompt Justice Samuel Alito to mouth “Not true” and the commentariat launched its own debate as to the propriety of the remarks and speculation as to whether the Court should show up for Presidential speeches at all in the future. Thus ended round one. But there are many rounds to come. Initial reactions to the decision literally ranged from pronouncements about “the end of politics as we know it” to declarations that the ruling was a “rousing victory for free speech.” Advocates on both sides promptly followed up with plans to reverse or temper the decision or to widen it even further. In mid-April White House senior adviser David Axelrod called the decision a case the president might keep in mind as he chooses a nominee to replace Justice Stevens. “He understands that the justice he appoints will be a pivotal voice on this court on issues like, for example, the one we just saw, Citizens United, where the court ruled that corporations have the same first amendment rights as individuals and they basically sanctioned a corporate takeover of our elections,” Mr. Axelrod told MSNBC. Virginia Thomas, wife of Justice Clarence Thomas, added to the commotion when she helped launch and became president and CEO of LibertyCentral.org, which calls itself “a major online resource for informing, motivating and activating everyday citizens around core founding principles of the US Constitution.” The group plans to work with the Tea Party Patriots organization. Ira Glasser, former executive director of the ACLU, wrote at Huffington Post that critics “have failed to appreciate what a great ruling it was for the First Amendment, and what a huge victory it was for freedom of speech and against government censorship.” He said liberals and Democrats should shift their attention to providing public financing that will enable more speech instead of restricting it. Related litigation is already underway. In late March, the D.C. Circuit court of appeals struck down federal campaign finance laws restricting independent political expenditures by groups. Opposition to the Citizens United ruling takes many different forms, ranging from proposals for new laws and new regulations, to Constitutional amendments, all intended to change or reverse parts or all of the decision. The Congressional Research Service has suggested that Congress has two broad choices: provide candidates or parties with additional access to funds to combat corporate spending; or restrict spending or require additional spending disclosures. A March report tallied nearly 40 bills introduced that involve the Citizens United decision, with more expected. Major policy questions, the CRS noted, include whether and how corporate and labor groups should be restricted in making independent political expenditures, whether spending by subsidiaries of foreign corporations should receive different treatment, and what information about political spending should be required. Several proposals have been introduced in this Congress to amend the Constitution to permit Congress to further regulate campaign finance. Rep. Alan Grayson (D-Fla.) takes a different approach. His “Business Should Mind Its Own Business Act” would levy a 500% tax on corporate political contributions. Remember those “I approve this message” acknowledgments in political ads? Rep. David Price (D-NC) and Rep. Mike Castle (R-Del) propose to extend that requirement to corporations, unions and associations using political ads. They call it the “Stand by Every Ad” Act. Sandstrom labeled current disclosure requirements “woefully inadequate” and called on Congress to mandate disclosure of contributions made to third parties for political purposes; to require shareholder or at least director approval for significant corporate political spending; and to require institutional shareholders, as fiduciaries, to vote for or against such proposed spending. Some commentators note that the decision appears to have opened up political activity well beyond the corporate sphere. At the moment, Democrats led by Sen. Charles Schumer of New York and Rep. Chris Van Hollen of Maryland are focusing on requiring disclosure of political expenditures by corporations, including personal acknowledgment of the major sponsor. James Hyatt, a retired reporter and editor for The Wall Street Journal, has been writing about business ethics and social responsibility issues since 2005.